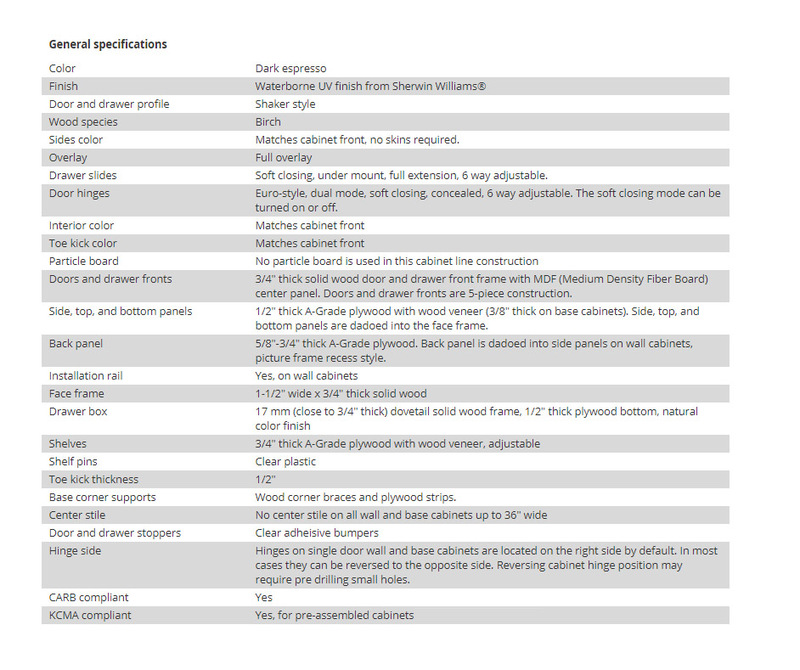 The Espresso Shaker option in branded ready to assemble kitchen cabinets is in a class of its own. The warm color and the rich finish blends in the chic and comfort factors all at once. When it comes to deciding on the kitchen cabinets you need to keep in mind the overall kitchen theme and décor. 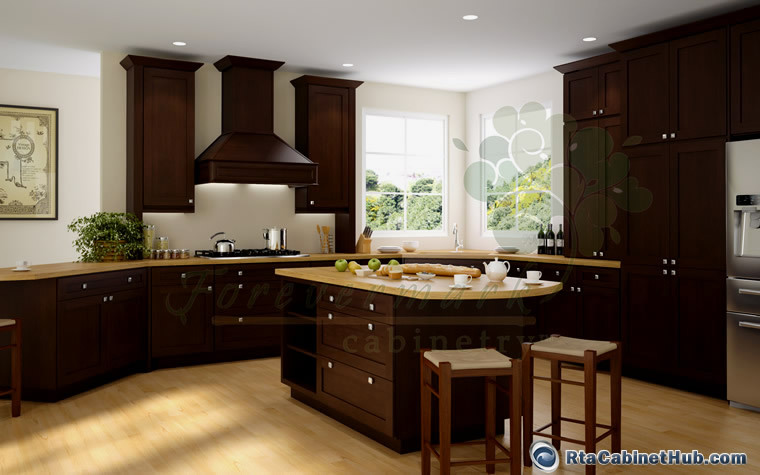 If you have a warm big kitchen in mind, which will have the openness of the country style and yet the practicality of an urban kitchen, then this design is perfect for your plans. The dark espresso shade acts a great contrast with the light floor tiles or wood finish as well as the lighter shaded walls. The overall effect is that of space and warmth at the same time. The actual use of birch wood is what provides the true essence of durability in this case. Many ready to assemble kitchen cabinets are made of board instead or real wood which makes them inexpensive but not very long lasting. With the Espresso Shaker option however you will have durable, strength, looks as well as affordability all rolled into one. The cabinets are a perfect blend of wood and plywood which makes it durable as well as not too heavy. This means that transportation cost will be less than the regular ready to assemble kitchen cabinets. Installing them will also be less cumbersome and less time-consuming than normal heavy cabinets. The drawers, drawer fronts, cabinet doors and the face frame are all made of solid wood. The doors have full inlay and come in the shaker style. The drawer fronts are made of MDF with wood veneer on the center panels. This is done to protect them from damage. It prevents paint or stains to crack on joints, helps to avoid hairline cracks and other wood deformations. The cabinet boxes and shelves are made up of light yet sturdy plywood. - You can finish your project within your estimated time because you don’t have wait around for stock to be replenished in stores before you get your order fulfilled. - Ease of assembly makes it easy to take the DIY route and save tons of money that you have otherwise spend in hiring extra labor to assemble and install. 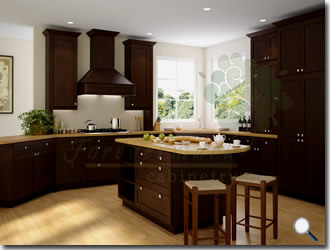 - You get great value for money because these are much more affordable than customized cabinets. - Great quality makes good return on investment as your kitchen will last for a long time with very little maintenance involved. - A wide array of choice gives you excellent décor and look without being an expert on the subject. The excellent quality, the perfect and aligned finished and the affordability all blend together to make this the perfect choice for your kitchen. And what’s more if you keep watch for the special offers and opt for the limited time discounts then you can save a whole lot more. Don’t just opt for regular ready to assemble kitchen cabinets. Opt for a brand which has a proven track of quality products and satisfied customers. Espresso Pepper Shaker product is identical or similar to Brazilian Shaker and Dark Epic Shaker cabinet lines offered by other stores.